David dreams of Sarah, carefully guiding him to a coffin from which Barnabas springs erect. He awakens, and Victoria in unable to calm him. Is Sarah a ghost? Perhaps that was how she could communicate with him. 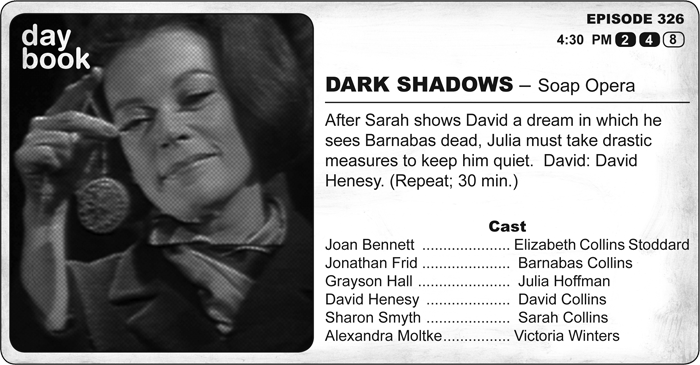 Meanwhile, Julia reports to Barnabas that Willie still lives. Barnabas frets that he may speak upon waking and underlines this danger to the doctor. At Collinwood, she learns of David’s dream and holds a therapy session with him, intent on hypnotizing him as she did Maggie. Unfortunately, David’s dream included a dark woman and her hypnodisc. When David sees this in real life, he knows that Julia is up to no good. He dashes from the room and calls for Vicki. What an interesting episode. David is set up marvelously from the beginning of the series, going from a bully to the bullied. To think that he begins as a master of information, wielding deceit, trickery, paranoia, and selective truths like the lovechild of Hedda Hopper and the editor of Pravda. He played adults for all he could, with a level of understanding far, far beyond what they thought he could possibly know. But none of us are beyond the reach of ignorance, especially when we’re at our smartest. It’s David’s intelligence and arguably dark heart that make him such a worthy victim. I don’t mean that he deserves it. He’s just an ironic target, perhaps because there is a frightening humbling that goes on with him. And yet, we root for him all the same. When Sarah gives him the vision of Julia and her hypnodisk, and he calls her on using it, cosmic justice is slathered on with with gusto, drowing Julia at the end in its wake. Just as he’s being out-smartypantsed by the supernatural, so is she… in his favor. At Collinwood, it raineth on the unjust and even-more-unjust alike. And Julia? She’s setting herself up for the fall for which she’ll spend the rest of the series in atonement. Ostensibly a healer, she’s out for her own ends, somewhere between power and dark romance, playing with the fire of Willie’s recovery while thinking she can best the cosmic force of Sarah’s conscience. She goes from bored psychiatrist, dreaming of being Ewan Cameron to actually trying her hand at it, only realizing that she’ll have responsibilities more vast than the forces of time and death. Kudos also to the design team for making David’s dream vision like a Steve Ditko vision of Hell. Yeah, if you look at the strange, black beams near Barnabas’ coffin against a red backdrop, the Dread Dormammu can’t be far behind.